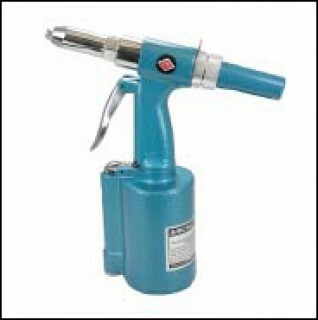 Compact Riveter is lightweight yet delivers a whopping 2,300 lbs of pulling force to effortlessly pull up to 3/16" (4.8mm) steel rivets. Comes complete with nosepieces for 3/32" 1/8", 5/32", and 3/16" rivets. Includes stem deflector for added safety. Will this unit pull CherryMax rivets? No, this unit (part number 12-01423) is not for use with CherryMax rivets. Does this require a compressor and if so what capacity? Per the manufacturer: yes, and it required 70-80 PSI. Will this unit pull AVEX rivets? Yes, this will pull AVEX rivets.